The 6 oz. (170g) of added weight in the built-up handle provides more control so that the utensil reaches the mouth easier. Good Grips® Weighted Utensils are ideal for persons with limited hand control, Parkinson’s disease or spasticity. Extra weight helps minimize tremors while eating. AllegroMedical.com presents The Good Grips Weighted Stainless Steel Utensils. Cushioned grip keeps the utensil in the hand–even when wet. Good Grips® stainless steel utensils feature a 1-3/8" (3.5cm) built-up handle. The soft, latex-free material has flexible ribbing that adapts to any grip. This handle design is so unique, it has a U.S. patent. Persons with hand arthritis, neurological impairments or generalized weakness will find these utensils comfortable, less stressful to hold and easily adaptable. 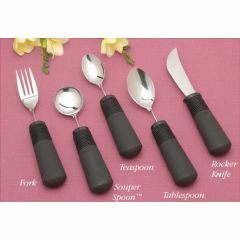 The Sample Kit includes a Fork, Teaspoon, Tablespoon, Souper Spoon ,and Rocker Knife. All utensils are institutional dishwasher safe. Almost every time I eat. The eating utensils are a god send. W/o them it is more often than not difficult to eat.